Okay, so not exactly. For as many people hear about Texas on the news, I still get the impression that a lot of people who haven’t visited think that we’re all cowboys and hicks in the South. As a civil engineering student at The University of Texas as well as a proud member of the Longhorn Band, I can tell you that this stereotype is completely false. In fact, the word y’all is much more prevalent in Florence, KY, where I’m working for this semester. 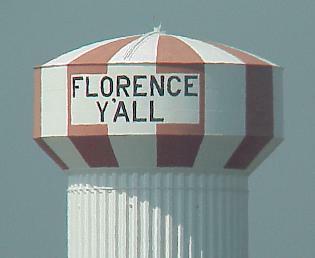 I was greeted to “Florence Y’all” plastered on the local water tower on my drive into town, reinforcing the fact that I’m still in the South (that and the SEC….but we won’t go there). I’m truly blessed to have the opportunity this upcoming semester to work on detailing the steel for the new Fun Spot White Lightning coaster. Although this is only my fourth day at the office, I have been thrown into tons of AutoCAD work and fully immersed in the friendly, encouraging culture that defines Great Coasters International. Jeff, Joe, Evan and Adam are quite possibly the best co-workers anyone could hope for. As many of you reading this are probably wondering, I ended up in this position as a result of continually pursuing a passion and believing that there was an opportunity to succeed despite unfavorable odds. However; to those of you who work hard and persevere through whatever obstacles you may encounter, I promise you that you will come upon some kind of success. Most importantly, find a way to make yourself stand out. Show that you are passionate about sustaining and furthering this industry. And most of all, have patience. My interest in roller coasters stems back to my first roller coaster ride as a child. I do not remember the roller coaster name; however, I remember the layout and how much I enjoyed that ride. It was a kiddie coaster at Riverside Park in Agawam, MA, now known as Six Flags New England. When I was in sixth grade, everyone had to present the careers that they were passionate about. Some kids wanted to be astronauts, others doctors and some even professional athletes. I, however, wanted to be a roller coaster designer. And as many people’s career interests began to grow away from those of their childhood dream, mine continued to flourish throughout high school. During my senior year in high school, for a class called ISM (an independent study and mentorship program), me and my friend, Ian Mair, designed and built a backyard roller coaster, known as The Predator. While not the boldest or baddest roller coaster in the world, the experiences we gained from working with structural, mechanical and electrical engineers were the most invaluable experiences I’ve ever had. Take any engineering experience that you can find, as it is crucial to learning to work with a problem solving mindset. My first summer internship was two years ago as a worker for Terracon. I mainly inspected rebar and concrete on various jobsites. Nothing screams “roller coaster design” like standing out in the 100+ degree weather with jeans and steel toed boots on, telling the contractor that his or her concrete was too hot to pour or had too high of a water content and being yelled at for it. While not necessarily obvious to many how this contributed to my current internship, working firsthand on a jobsite, reading blueprints and communicating with contractors has been extremely valuable in my pursuit of a career. Skipping over last summer working at the Texas Department of Transportation designing bridges, I ended up at IAAPA this November upon being highly encouraged by Evan to do whatever I could to attend this convention. Stepping onto the red carpet of this monstrous convention is utterly overwhelming for the first time. Thousands of lights disorient your senses, and the sounds of carnival rides overwhelm the 1,100,000 square feet of exhibition space. Essentially, it’s heaven for the child that still remains in each one of us. This was the crucial experience in my search for an internship in the amusement industry. Having one on one experience with every major professional in this industry is the most insight you can gain into this industry. As a result of attending IAAPA, I was considered out of hundreds of applicants for this position. How I ended up here was a matter of luck, hard work, and perseverance. I look forward to keeping y’all updated on the experiences I have at Great Coasters International. I cannot express how great the work culture at GCII is, and how welcoming and knowledgeable the employees here are. I could not see myself having a better opportunity to experience the amusement industry than working right here in Florence, Y’all! The local water tower here. At one point, it read “Florence Mall,” but due to governmental violations with using public funds for advertising, was cleverly changed into “Florence Y’all.” It was the first thing I saw upon arrival. It’s been a few weeks, so I figured I’d give you a quick update on what’s been happening around the shop. Fun Spot progress continues, as the first powder-coated steel has arrived on site in Florida. Another truck has left the shop for powder-coating, and we are already working to get material ready for a third. I’m not exactly sure how many trucks it will take to finish this project off, but rest assured that these first two only scratch the surface. One thing that GCII really allows the interns to do is make contact with several of our vendors. I was sent to the powder-coater to load the first truck headed to Fun Spot, and given responsibility to make sure things were loaded and packaged properly. Since this is a first-time deal for everyone involved, there are still several kinks to be worked out, and I had to straighten some of them out myself on this particular trip. As far as I’m concerned, all of these kinks center around getting the steel to Fun Spot in the most perfect condition possible. We have to consider the fork lift moving it around, the steel shifting around in the bundle itself, and finally the cribbing the steel rests on in the truck bed. Our guys are working hard with the powder-coater to make this happen, and I hope the finished product will reflect that work. Well, that’s the vast majority of what I’ve been up to the last 2 weeks at the shop. This week will be my final week here in Sunbury, and I will be back with a final wrap-up of my experience here in the next couple of weeks. The last couple of weeks have been really busy here in PA, as we are now in full steel processing mode for Fun Spot as well as finishing up numerous tasks having to do with the transfer table project. I’ll talk a little bit this time around about both projects and the progress we are currently making. The bulk of my time the last couple of weeks has been spent cutting steel to length for the White Lightning project at Fun Spot. While the task of cutting using a band saw is simple enough, what makes it somewhat difficult is maintaining the tight tolerances our drawings require while still moving at a tempo quick enough to get the job done in a reasonable amount of time. However, it becomes easier and easier when you are making almost 700 cuts in a week’s time. I enjoyed the responsibility of maintaining quality on pieces that will actually be put on a ride, as well as the task of figuring out how to do it quicker while still maintaining that high standard. One of the greatest parts of working for a small operation like Great Coasters is that each and every person’s time and skills are utilized to the maximum, interns included. While Colin and I are both here to learn as much as we can about the amusement industry and how this company operates, Great Coasters really allows us to work independently, which gives us responsibilities and experiences we might not be able to get at a larger company. I’ve been given the opportunity each of the last two weeks to go out to the site and work on our transfer table project, and both times on site have offered me great hands-on experience. I’ve actually gotten to help put a deck together, as well as aid in setting up with some of the mechanical components of the table. Everything happens more quickly on the job site than in the shop, which is primarily a function of it being assembly only. However, there’s still a ton of work to do and it still takes a crazy amount of time to complete things. It’s neat seeing the small parts that have been created and sub-assembled in the shop placed in the larger structure of the ride, and how each and every small component will actually work together in the grand scheme of things. I’ve been taking pictures of the steel process for Fun Spot, and hopefully those will be posted very soon on the site! A month is in the books here at GCII, and time is flying by. I can’t wait to tell you more next time!